Dates: July 6 & 7, 2019. Competition Water: Similkameen River near Princeton. Eligible Fish Species: Whitefish, Cutthroat, and Rainbow Trout. No Fishing Period: All competition beats are closed to fishing as of 6:00am on June 24, 2019. Practice Area: Competitors can practice upstream of the A&W, and the areas at and downstream of the Highway 3 bridge, which is located approximately 11 miles east of Bromley Rock. 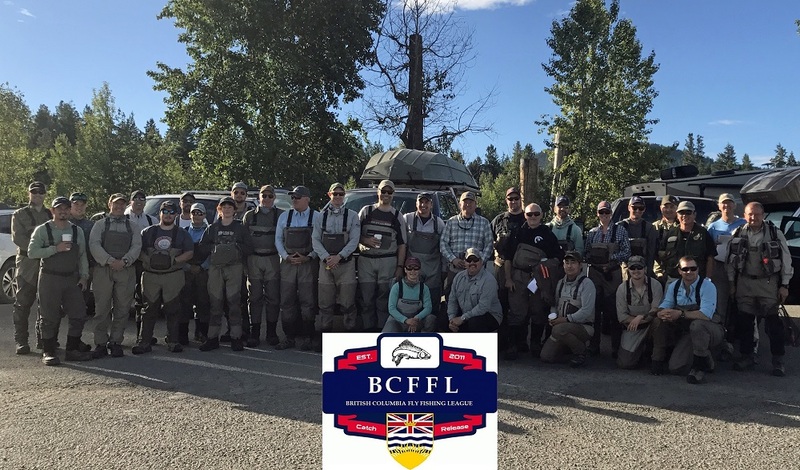 BCCFFL Competition Status: 900 point scale for the British Columbia Competitive Fly Fishing League. FFC Competition Status: Level 2 - 700 point scale for the Fly Fishing Canada's National Ranking Points. Scoring System: 1 point per fish (for quicker scorekeeping and medal presentations). Number of Competitors per Groups: Logistics require that there must be 6 competitors per group (this is a 6-man-team event). Individuals will be assembled to form a team of 6 competitors or can be recruited by any teams that are short a team member(s). * Participants and volunteers are required to wear CSA Approved Personal Flotation Devices (PFDs) and eye protection at all times. 2. 2019 Fly Fishing Canada Membership Card Holder Discounted Rate: $10.00. 3. Registration fee for your team is due in full and must be received by Friday, February 22, 2019 in order to officially complete the registration process and secure your spot for your team at this event. 4. Team captains or managers are responsible for submitting a single payment for all 6 members of their team. 5. Please send your e-transfers to: chrispuchniak@shaw.ca or contact Chris Puchniak for his mailing address if you wish to send a cheque or money order. • Registration opens at 6:00pm on Friday, January 25, 2019. • Members of the B.C. Fly Fishing League being given top priority during registration. • Registration for the general public will be opened on a first come, first served basis in the event that there are any vacant spots. • This is a team event, with complete, 6-angler teams being given priority during the registration process. • Teams are required to provide the names of the 6 members of their team when submitting their registration. • Competitors and teams that are submitting registration must be 100% committed to attending this event! • Individuals and teams are welcome to register for the waiting list in the event of any cancellations. • Early registrations will not be accepted. This event will serve as a work project for the Southwestern British Columbia Chapter of Trout Unlimited Canada, with a river cleanup, youth involvement, and the gathering of fish data for regional biologists being the project. All volunteers will be required to sign the Trout Unlimited Workday Sign-in Form during the Competitors' Meeting, which is being held at 7:30am on July 6th in the A&W parking lot. The Workday Sign-in Form ensures that all of the participants and members are covered under Trout Unlimited's liability insurance and provides the Southwestern British Columbia Chapter of Trout Unlimited Canada with permission to use photos taken at this event for promotional purposes. Number of competitors per team: 6 <<< NEW FOR 2019!! This is a competitor controlled event with sessions consisting of 2 hours fishing time per session. Competitors will fish 2 beats per session. 60 minutes of fishing on each beat. 20 Minutes of fishing time in each third of each beat (A.K.A. beat-third). 3 sessions on Day One (AM, Noon, and PM). Competitors will fish 10 beats at some point during championship. Competitors in the bottom section rotate to the top section of the beat. Competitor positioning within beats: 3 competitors per beat (see schedule for details). Competitor Rotation: 20 minute spent fishing within each beat-third. Competitors are invited to meet for dinner, drinks, Day One Results,and socializing at Billy's Family Restaurant, 301 Vermilion Ave, Princeton BC on Saturday evening, July 6th from 6:30pm - 8:00pm. FISH RECORDING: Each and every fish, as well as the time, must be recorded by the competitor that caught the fish (on their own scorecard) immediately following its release. Recording multiple fish at the same time is not permitted. Individual and team results will be recorded. Medals will be awarded to the top 3 teams and top 3 individuals. Individual results will be included on the BCCFFL Leader Board (900 point scale).Individual results will be submitted to FFC for inclusion in their NRP (650 point scale). Please note that a draw for Groups for the members of each team will be performed 2 weeks prior to this event, in order to ensure that a driver is available for each group of 3 competitors. The Draw will be performed by a third party. Competitors will stay in their assigned group for all 5 sessions. Once the competitors have been assigned their Group, the 6 competitors in each group will be divided into 2 groups that consist of 3 competitors. Carpooling to the beats will be arranged as soon as the competitors have identified their Group Letters and Numbers. The 3 competitors in each half of their group will carpool and stay together for that entire day. The following format for the rotation for this event has been created in order to ensure that all 36 competitors will fish a total of 10 beats at some point in time during this championship, which is the ideal and most effective way to ensure that there is an equal opportunity for all teams and individuals (everyone fishes the top producing beats as well as the lower producing beats). There will be 6 competitors assigned to each Letter Group. With each Letter Group fishing on 2 beats for a combined total of 2 hours (1 hour per beat). 3 competitors will fish on 1 of the paired beats and the other 3 in their Letter Group will fish on the other beat. Competitors will relocate and to the other beat in their pairing after 1 hour. This will ensure that all 6 competitors in each Letter Group will fish the exact same waters during each of the 2 hour sessions. There is a 30 minute allowance for competitors to relocate to the other beat, which should be more than sufficient given the rotation that is being used for this championship and the close proximity of the beats that have been selected for the beat pairings. Competitors are required to get off the water and relocate to their next beat in a timely fashion, and must adhere to the start and stop times on the schedule for this championship. Beat 1. Beat 2. Beat 3. Beat 4. Beat 5. Beat 6. Beat 7. Beat 8. Beat 9. Beat 10. A1. B1. A2. C1. B2. D1. E1. C2. E2. D2. A2. B2. A1. C2. B1. D2. E2. C1. E1. D1. B1. C1. B2. D1. C2. E1. A1. D2. A2. E2. B2. C2. B1. D2. C1. E2. A2. D1. A1. E1. C1. D1. C2. E1. D2. A1. B1. E2. B2. A2. C2. D2. C1. E2. D1. A2. B2. E1. B1. A1. D1. E1. D2. A1. E2. B1. C1. A2. C2. B2. D2. E2. D1. A2. E1. B2. C2. A1. C1. B1. E1. A1. E2. B1. A2. C1. D1. B2. D2. C2. E2. A2. E1. B2. A1. C2. D2. B1. D1. C1. Please note that the registration fee for your team is due in full and must be received by Friday, February 22, 2019 in order to officially complete the registration process and secure your spot for your team at this event. Team captains or managers are responsible for submitting a single payment for all 6 members of their team. Please send your e-transfers to: chrispuchniak@shaw.ca or contact Chris Puchniak for his mailing address if you wish to send a cheque or money order. I have added to the team list at the top which teams have paid their full amount and which have not. Please note that if a team member if NOT an FFC member before your registration fees are due (which is this FRIDAY), then the fee for those individuals is $15 and not $10. So that will dictate whether a team pays $60 collectively, or as much as $90 collectively (or somewhere in between). Thank-you to all of the teams for submitting their payments on time! Please note that Team EnDiable has withdrawn from this championship, and Team Bend has thankfully filled that spot, so we have 6 teams. Individuals are welcome to register for the waiting list in the event of any cancellations or to fill spots on any teams that are searching for a team member/ replacement.